On this day in 1939, Prime Minister Joseph Aloysius Lyons died in Sydney. He was 59 years old, and left a large family including his wife Dame Enid and eleven children. Lyons had become Prime Minister in 1932, after having left Jim Scullin’s Labor government and formed his own party, the United Australia Party, with the Nationalists. Lyons had been Prime Minister for seven years and he had won a record three consecutive elections. He was seen as a kindly, warm figure, with cartoonists often drawing him as a koala. Lyons’ death was the first of a sitting Prime Minister. The country was in mourning for one of its most popular and respected leaders. The Governor-General, Lord Gowrie, therefore appointed the leader of the Country Party, Earle Page, as Prime Minister until the UAP could choose a new leader. Page had been Treasurer since 1934 and was the leader of the junior coalition partner, Deputy Prime Minister in all but name. In this photo from around 1935, you can see Lyons with members of his government. Lyons is front right, with Page over his left shoulder. 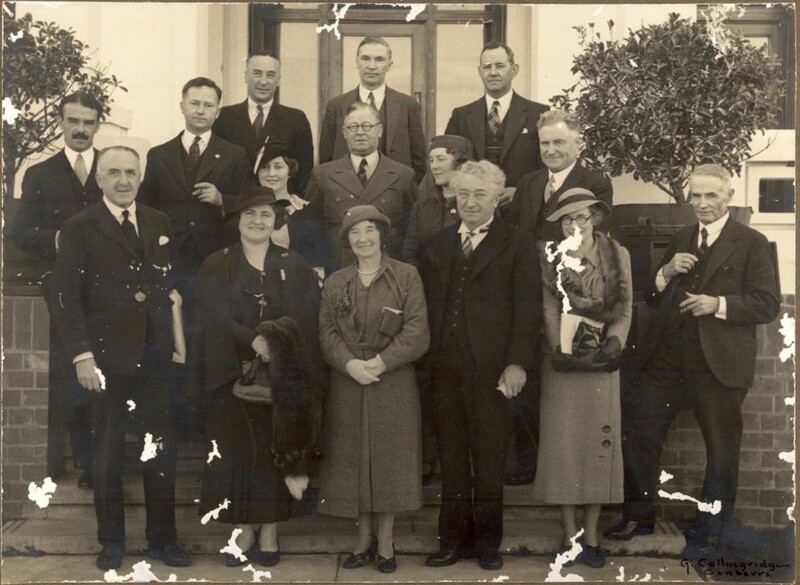 After a short period with Page as PM, the UAP elected a new leader and Menzies was chosen. It wasn’t a landslide. While accounts differ as to how many votes each candidate got, Menzies is generally regarded as having had quite a narrow win against, among others, Billy Hughes and Richard Casey. Page did not like Menzies at all, and in Parliament he made a vicious speech accusing Menzies of cowardice for not having fought in World War I. Dame Pattie Menzies never forgave Page or spoke to him again. Joe Lyons with members of his government (and others), outside Parliament House, Canberra. Museum of Australian Democracy collection.